What Size Do I Need for my Garage? Is 120v Enough? Looking for a heater to keep your garage or shop warm? There are tons of different 120v electric garage heaters out there, and it can be overwhelming to weigh the pros and cons of each in a sea of options. 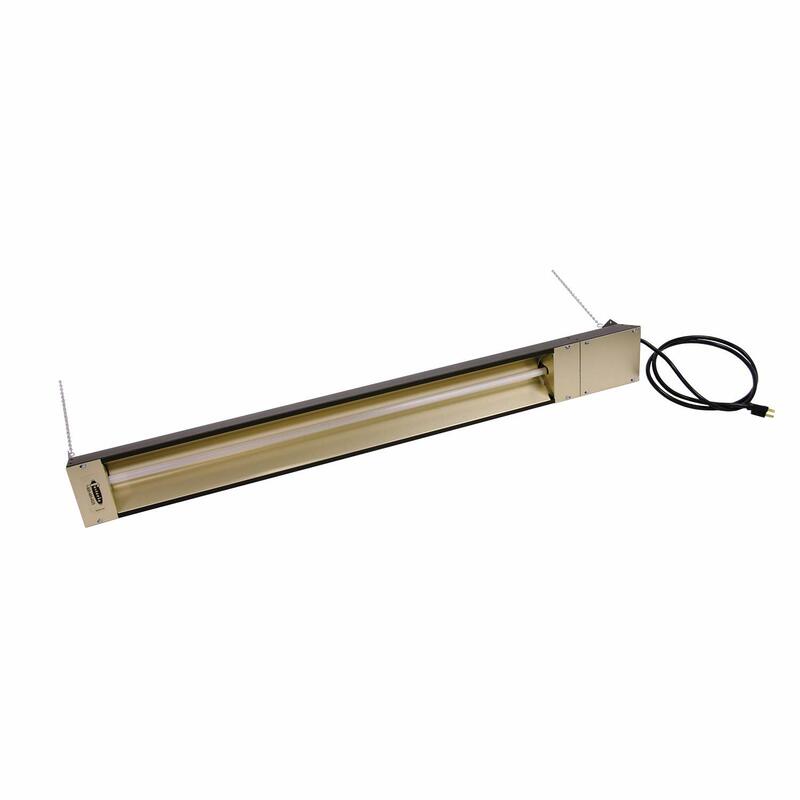 120v heaters can be ceiling-mounted or are offered in a basic standing design. Understanding the voltage and heat distribution you need for your specific garage is key for finding a heater to get the job done right. We’ll take it from there and discuss the pros and cons of quality space heaters to help you pick the right heater for your garage. 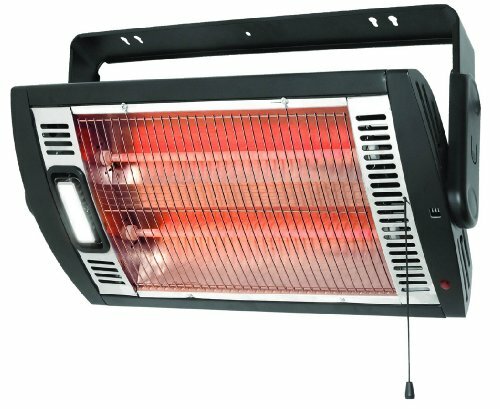 The best overall 120v garage heater. You will not be disappointed with this efficient and effective heater. 120v is a fairly small sized heater, but will absolutely get the job done for a smaller space. If you have a garage larger than 30 x 30 feet or a bigger garage that is not well insulated, you may need something with a higher voltage to keep it at a comfortable temperature in winter months. A 220 volt is really designed for commercial spaces, so, if you are trying to heat a medium-sized space it may be worth investing in two 120v heaters. 120/110 volt power outlets can take on between 15-20 Amps before the power breaker is affected. Check to see if your garage has a single breaker managing all of your lights and outlets or two or more breakers managing different outlets and lights separately. Below you will find in depth reviews of the top ceiling mounted garage heaters. We take a look at the bets currently on the market and give you a review on each one. The Optimus H-9010 is perfect for your garage as it can be ceiling or wall mounted. This saves space and is safer as it prevents the heater being knocked over or coming into contact with flammables. Additional safety features like overheat protection are also included. Two heat settings (600/1200 watt) provide sun-like heat as well as a soft light. 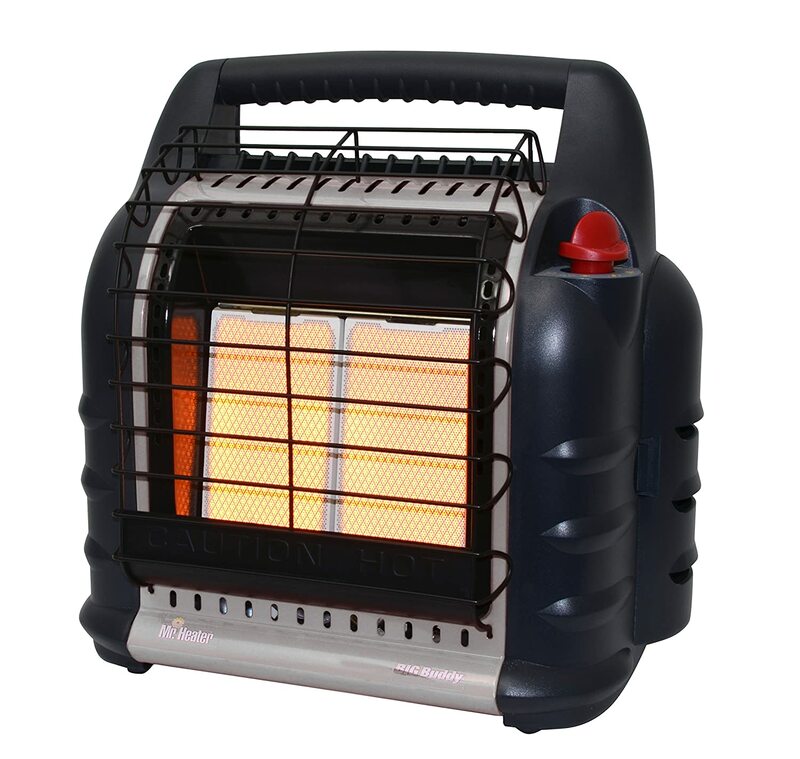 The heater also contains quartz heating elements, halogen lights, and a pull cord for ease of use. The heater is constructed with a metal housing and bracket for long lasting life and the unit contains overheat protection. This is a great ceiling mounted heater for your garage, with the required safety features and a convenient pull cord to control it. It also helps to illuminate your workspace, thus keeping you warm and ensuring you can see what you’re doing in cold weather. This ceiling mounted heater is controlled with a single pull string, which operates both heat settings, as well as the halogen light. It can be used without having the light on so the heater works independently of the light. It has the necessary safety features to keep you secure in your garage, such as an overheat protection sensor, safety metal grille, and a three-prong grounded plug to protect from electrical risks. The ceiling mount for this heater gives you extra safety, security, and floor space. Best of all, the adjustable tilting bracket for this heater lets you point the heater it in any direction to provide you with targeted warmth wherever you need it. This is a great combined heater and light for your garage, as it lets you heat up any part of the room where you need it, and stay warm while working in cold weather. Being both energy efficient and durable, you’ll find this heater very good value. This heater is not only designed for garages and workshops, but is also great for covered patios or decks. It can save up to 30%-40% on electricity when compared to traditional heaters. You may just get a great return on your investment with the Vesonel. The Vesonel is much more effective in a closed in garage or shop. Those who used it outdoors did complain that without sitting within a 3-foot radius of the heater, it was difficult to really feel its effects. This ceiling mount unit offers 1500 watts of heating, which makes it great for smaller spaces. You can go for that old-fashioned workshop look, as it includes two chains to hang it with; or you can mount it with included brackets that provide a 45-degree swivel range. This is a radiant heater, so there’s no fan. But it provides consistent heat from ceiling to floor. In the next section there will be reviews of the best standing garage heaters. These are different from the ceiling mounted heaters that were reviewed above. The Dr. Infrared Heater is a safe and highly efficient standing heater. It has an energy saving auto mode and high and low settings. When the mode is set to auto, the unit will cycle on and off and switch between high or low settings to maintain the desired temperature setting. The heating system features an infrared quartz tube + PTC with a 12hr automatic shut-off timer, an IR Remote Control, a high-pressure, low noise blower, an electronic thermostat (with a range of 50 to 86 degrees), and caster wheels. It weighs 24 pounds and uses 12.5 amps of power. 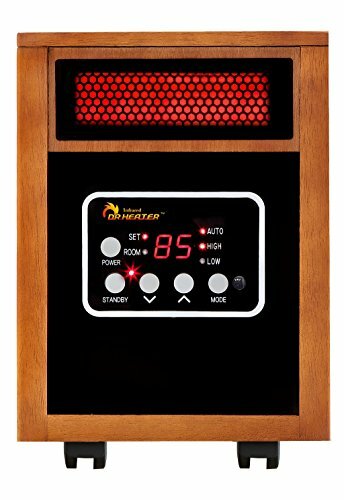 This heater is engineered and designed in the USA. This little heater gives great value for your money, as it heats up medium-sized rooms quickly and efficiently, while keeping noise to a minimum. The IR remote control and long lasting design ensure that you’ll find it convenient to keep your room warm. 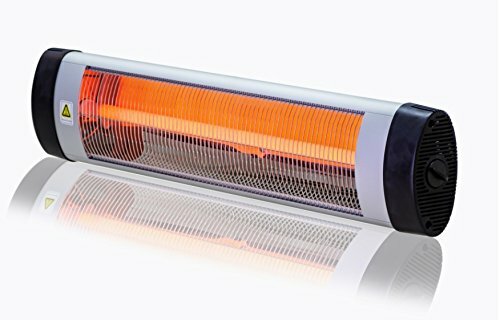 This standing 1500W heater from Homegear has a dual heating system containing mica and quartz infrared heating tubes. It can efficiently and quickly heat up a medium to large size room. The LED display allows for easy monitoring and the quiet and efficient blower fan spreads the heat around the room. The included remote control allows for convenient control. 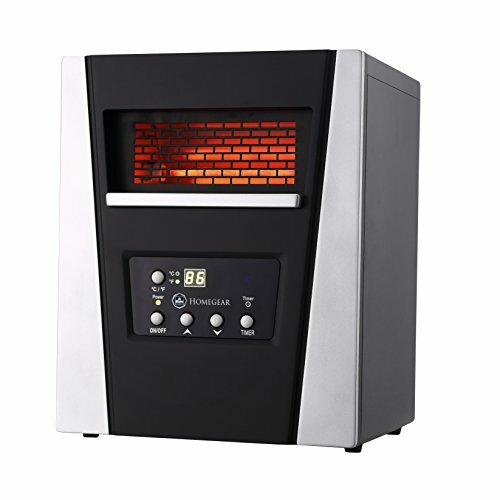 The heater is ETL certified, has built-in overheat protection, and provides 5100 BTUs of output. 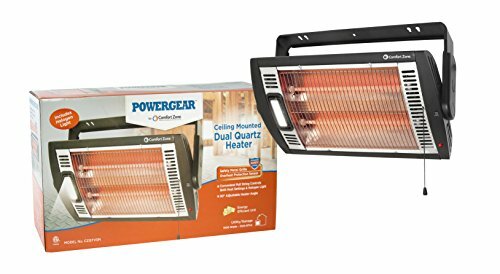 This is the right heater for keeping your garage warm during the winter if you want to be able to move it around and maybe use it in other rooms. 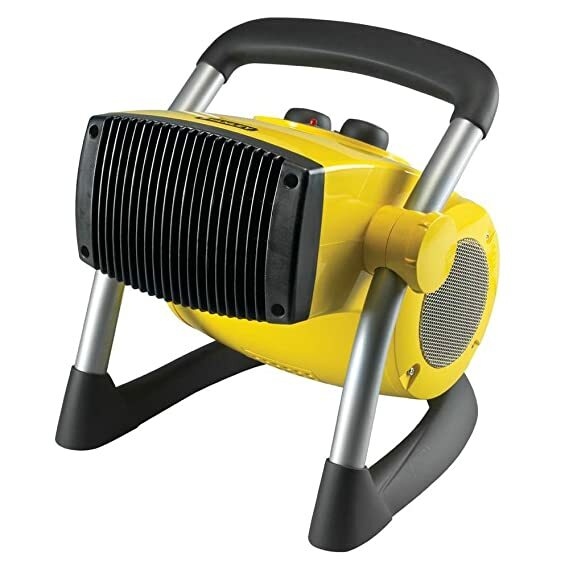 This 4,000-18,000 BTU LP heater connects to 2 one-pound cylinders and is ideal for heating a garage up to 300 sq. ft. The integrated fan increases the heating capacity of this unit, blending radiant and convection style heat. The two swivel regulators allow you to use either disposable cylinders or a remote gas supply like a 20-pound cylinder after purchasing a single hose and filter. The built-in Piezo sparking mechanism will turn on the heater and the Oxygen Depletion Sensor (ODS) and accidental tip-over safety shut-off will keep you safe from carbon monoxide poisoning. The low, medium, and high heat level control knob is good for maintaining steady temperatures. The fan runs off four D-size batteries or an AC adapter. 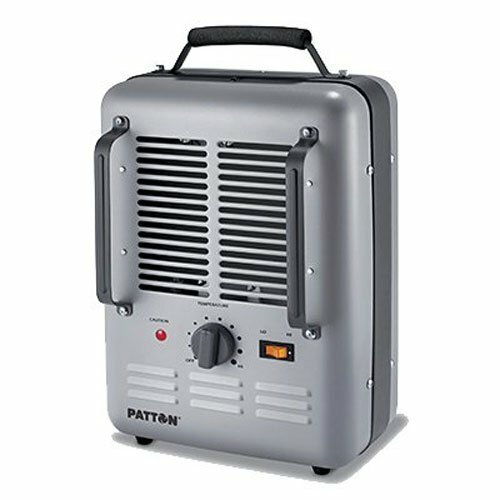 The Patton Milk-House utility heater is definitely the most well priced electric heater on the list. But how does it stack up against the competition? The heater is definitely only for small sized garages and shops that are already well insulated. It has all of the top-of-the-line safety features and personalized heating options without the hefty price tag. The garage heaters below are ones that barely missed our top list, but are still solid heaters and deserve to be mentioned. You can check those out below. The Lasko is a great compact heater that comes with the added convenience of being pre-assembled. No nuts or bolts here! The pivoting heater helps to distribute heat throughout a space or specifically right where you need it. The dials and varying fan strengths help you to further personalize your space heater experience. The heater is ETL listed, which means it has met safety standards and requirements by a testing organization and certifying body in Canada. 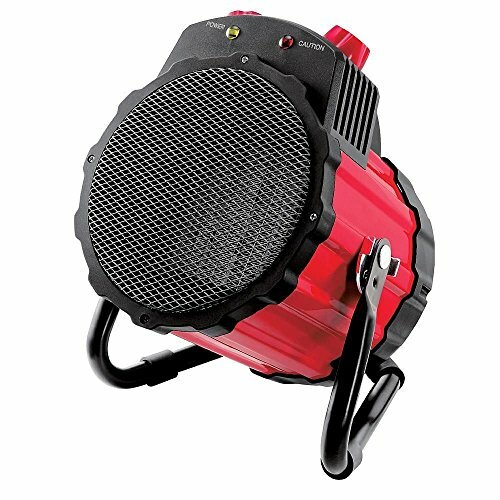 The Craftsman Portable Heater is perfect for tighter spaces. It heats up quickly and keeps hot air circulating. You can adjust the temperature to your exact specifications thanks to the 4-notch dial and wattage options. The fan may not be strong enough to get the job done for larger spaces, but for working in compact woodshops or garages it’s a great heater. As far as price, nothing really beats the Craftsman. 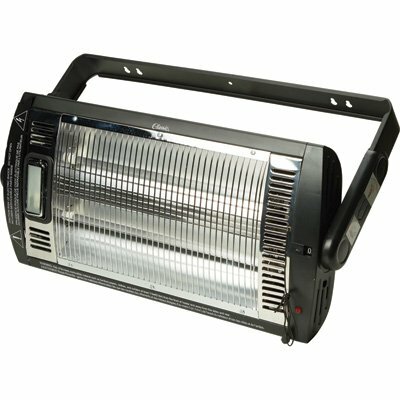 This heater comes equipped with a halogen light to heat smaller spaces during cold weather months. Held by a 90 deg vertical tilting arm with a durable metal housing and high-efficiency quartz heating element, this is a great pick for heating your shop or garage. While it’s is not great for sub-zero or below freezing temperatures, it is excellent for those 32-50 degree days. When it comes to space heaters, a heater can only heat your garage or shop to your desired temperature proportionally to the size and insulation level of the space. It is also important to take into account the outdoor temperature you will be using the space heater to offset. All in all, these are all great options to accommodate different garage sizes and heating needs for all budgets.